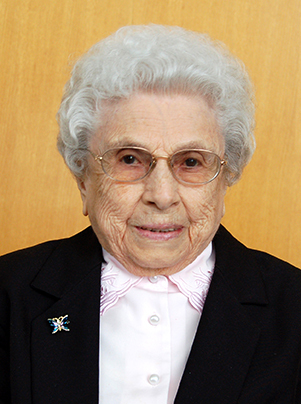 Sister Delora Schweitzer, 98, a founder of the Benedictine Sisters of Annunciation Monastery, Bismarck, passed into eternal life Monday, Aug. 26, 2013, at Annunciation Monastery. Mass of Christian Burial is scheduled for 4:30 p.m. Thursday, Aug. 29 in the Chapel of Annunciation Monastery. Visitation began yesterday and continues at the monastery until the time of the funeral. A wake will be held at 7 p.m. Wednesday in the monastery chapel. Sister Delora (baptismal name Mary Magdalene) was born Jan. 7, 1915, in a sod house south of Dodge, N.D. She was the third of 11 children of Sebastian and Johanna (Vogel) Schweitzer. She credits her Benedictine monastic vocation to her parents’ faith and family values. Mary Magdalene attended a one-room country school. After graduating from eighth grade, she went to high school at St. Benedict’s Academy for Girls in St. Joseph, Minn. There, with Benedictine sisters as teachers, she observed religious life in action and liked what she saw. In 1937, she entered St. Benedict’s Convent, St. Joseph, Minn., became a novice in 1938 and was given the name, Sister Delora. She made monastic profession July 11, 1939. She taught elementary grades in Eau Claire, Wis., Red Lake, Minn. and Fairfax Minn. until 1944 when she became one of 144 sisters who started the Bismarck Benedictine foundation, now known as Annunciation Monastery. Sister Delora earned a bachelor’s degree in education from the University of Mary and a master’s degree in education from Loras College, Dubuque, Iowa. With a great love for children and teaching, Sister Delora served as an elementary school educator for 42 years. She taught at St. Patrick’s School, Dickinson; St. Joseph’s School, Mandan, and Cathedral School, Bismarck. She taught and was principal and assistant principal at Christ the King School, Mandan from 1957 to 1981. She spent summers teaching children in religion education classes throughout western North Dakota. After retiring from full-time teaching, Sister Delora served as a tutor in the Learning Skills Center at the University of Mary. Sister Delora enjoyed people. She was always interested in others and cared about whoever she encountered in her life. She had a deep love for her Benedictine community and her family. Social gatherings and prayer services were special to her and she seldom missed them. Her hobbies included reading, sewing and growing plants. She had a way with plants especially African violets, and often brought another person’s ailing plant back to life. Sister Delora is survived by three sisters, Sister Rose, Sister Francis, Frances Fleckenstein, all of Bismarck, a brother, Adam, Bismarck, an extended family and the Sisters of Annunciation Monastery.